One of the things I love about decluttering slowly but surely is that I am not forced to make rash decision as to what should and shouldn’t be decluttered. With my goal of one item a day there is only one decision to be made each day. Some decision are made in advance and eventually the day comes where I think “That will be my declutter item on the day.” Some decisions are spur of the moment when I stumble across an item that I had missed before but am in no doubt that it can go. While other things get passed over time and time again and left until I am ready to make the final decision on. There are also things I know I want to declutter but am not ready to deal with the hassle right now and that is OK too because I am still running to schedule. One day their time will come when I have the patience and inclination to focus my full attention on them to complete the task efficiently. There are so many things that weren’t even on may radar at the start of my declutter journey but now are easy to let go off. This is because as I continue down this path my attachment to stuff in general becomes weaker and weaker. I am more enthusiastic to unburden myself of the clutter than I am to keep it. Things had better be loved, useful and not in excessive amounts or they are out of here. So if you have something you aren’t sure about pass it by for now and move on to something else. Being conflicted over something when there are easier fish to fry is a waste of metal energy. Later on you might look back at that item again and think, I really want this gone more than I want it here so out it can go. It is actually a good feeling when you come to these conclusions because not only are you letting go of more stuff but you have clearly graduated to a new level of detachment to material things. And that is something to be celebrated. Remove something from your yard that a neighbour might be able to see and think looks out of place or unsightly. Ask the neighbour if you aren’t sure and are game. This jewellery box was no rash decluttering decision. I had been contemplating emptying it and decluttering it for a long time. There was no hurry as there were plenty of other items to declutter in the meantime. Finally the task is done and the box is off to the thrift store. I am still finding avenues to sell some of the contents so they will filter through as declutter items in the near future. This is such good advice! And it’s so true. I’ve been by-passing an item for years, knowing I ‘ought to’ declutter it–one of those aspirational things. Finally I am able to admit that I’m not going to use it. What really helped is that I put it in a prominent place in the house and had to look at it all the time. And it was in the way. It will be leaving this week as at last I sent the email to arrange its removal from my life. Another good post and so true. I know there are things that I still need to declutter but have put off due to needing time to actually sort through and make decisions about how to rid myself of them. I need a time when I will sit down and actually just sort through and decide what to do with it all. One thing that is good for me is that it isn’t in a place that is out in view. I know it is there and I know I need to get to it at some point. It’s just finding the time. I’m hoping it will be this week. Wow – great post! Lots of good advice to glean from this one that’s for sure! Funny you decluttered a jewelry box – I have one about the same size as the one you just decluttered that I would love to part with & find an even smaller version as I hardly wear jewelry & would rather not have a jewelry box sitting atop my dresser anymore…but until I find the “right” one or at least a better alternative – I’ll keep it..but man oh man does it bug me for some reason. Maybe I’ll make a truly conscious effort to find an alternative this week & finally get that giant monster of a jewelry box off my dresser once & for all! Jane, I don’t have a jewelry box anymore. I keep my earrings in two ice cube trays in a drawer with my makeup. I installed cup hooks inside my closet to hang all my necklaces from. That’s brilliant! I only have 2 necklaces & 2 or 3 bracelets & a few earrings – nothing that would even be considered a collection. I wouldn’t mind something with a lid, but in the meantime – I may just have to give your idea a go! Hi Jane – my husband put up a pin board for me inside the wardrobe, but since I have decluttered my jewellery, I could make do with a hook. I don’t wear earrings though am thinking of having my ears re-pierced, so if I do get them pierced I’ll re-evaluate what I need then. I used to store my jewelry in more creative ways (hooks, test tubes, bags and wooden or paper boxes) for a long time. However, a few years ago, I thought, I’d need a “real” jewelry box, in order to be more grown-up and ladylike (or whatever). similar to sanna, I had also creative ways of storing jewellery. I got a collection of candy coloured plastic hooks from my mum when she decluttered somewhere. I put them on the side of my wardrobe, all my necklaces and bracelets were hanging there. For earrings and other jewellery knickknacks I always had a little wooden jewellery box from my grandmother (its not with compartments or anything). it contains not a lot these days. I remember times when I had troubles closing the lid… Its a beautiful piece and I dread the day I will give it away, but I know I eventually will not use it anymore. It will be one of the items that requires time to part from. just like colleen described in the post! 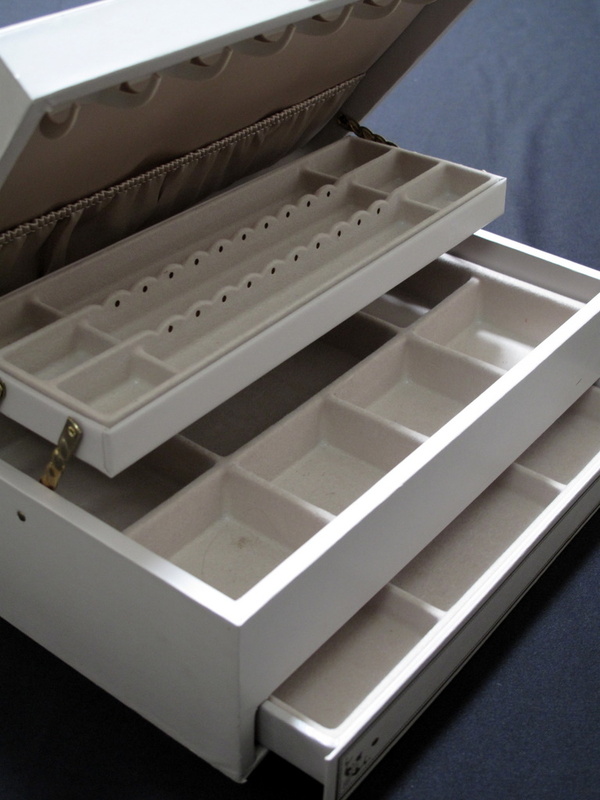 Wow – lots of great jewelry storage ideas! 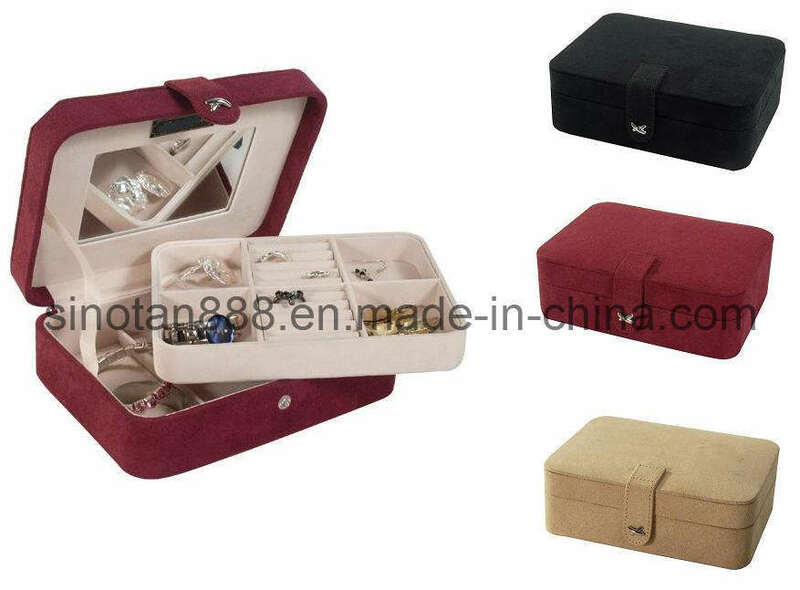 I looked online & think what might work is a travel version of a jewelry box. 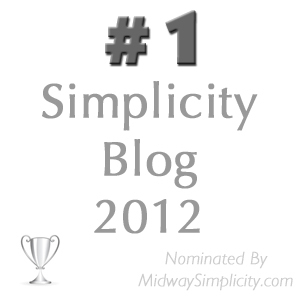 Small footprint, portable when need be, can store it away in a drawer out of sight, doesn’t hold much – just what I need. My current monster jewelry box has my maiden name engraved on an attached plaque atop the box – another thing that always irked me – think I’ll wrangle off that plaque & send the jewelry box to the thrift store today. Jenna, I just searched for travel size jewelry boxes – some are HUGE! Sanna – that is exactly what I’m looking for! Perfect size! Thanks for the photo link! I’ve worn very little jewelry for years. I have so little of it now that all my earrings are in tiny ziploc bags stored in one of those small papier mache boxes that you can find in any craft store. I recycled one of the boxes I received at Christmas once. It has snowmen all over it, lol. I plan to decoupage it with my own artwork one of these days, but for now, it doesn’t bother me at all to have the snowmen showing. I have no jewelry except a watch and 2 bracelets I’m think about decluttering. My mother has a lot. If I ever want to wear something I can borrow from her. I found a hanging plastic thing with pockets. they have them in different sizes. With this she can have a seperate pocket for each item. The necklaces don’t get tangled if you are careful how you place them in it. She has everything in there and it hangs in her closet along with her clothes. She loves it. She can see everything she has without having to dig in a box or something like that. Right on, sister. We don’t need to put extra pressure on ourselves into making decisions we are not ready to make. Afterall, one of the purposes of decluttering is to make our lives better, not more pressured fill. You have mentioned decluttering jewelry at different times and I thought I was doing pretty well there. But the other day I was down with a virus and I saw my little jewelry box and decided to give it a once through. And I was so happy that I did. My daughter had lost her watch recently and needed a new one. When I looked through my jewelry box I saw a watch that I had planned on giving away once I got a new battery for it. Well, my daughter loved the watch and not only was it decluttered from my box but it saved my daughter a new purchase. I worried that it looked a little grown up since she had had a pink one before and so I asked her if the style was alright and she said, “Yes! I am so glad that it is not pink!”. Win win. I decluttered my jewelry boxes a few years after getting married. I condensed my jewelry into two clear craft boxes that fit in the top drawer of my dresser. Six months later, my husband was trying to come up with an anniversary gift, and bought me a jewelry box! It didn’t get taken out of the box, just back out the door. He has done much better with gifts since then!! That is a jewelry box and a half! I have a frame with thick fly screen, which I hook earrings into. But it hasn’t solved necklaces and bangles. It’s a planned craft project… I need a bigger frame (will thrift buy or from freecycle), and then I can put the necklaces on it to, and put it up somewhere, likely the bathroom. Finally posted some freecycle items, and almost all have been picked up or promised. And as I promised myself, with two puzzles outbound, I collected some from another freecycler. She was sad I only took 3, but I promised to be in touch once I’d done them! I have three S shaped hooks (plastic, but like butcher hooks) for necklaces, they hang over the rail next to my clothes. A very simple solution and it means that you can see them very easily when deciding on clothes. Yes Colleen – I agree totally with things needing to be “loved, useful and not in excessive amounts “. Since I have been on my decluttering mission over the last few years something unexpected has started to happen . I have from time to time had little collections of things (bubble glass bud vases from the 60’s , hand crocheted rugs and a few other collections ) BUT I cant do it anymore – the bud vases were the first to go – I had had so much fun finding them in op shops and garage sales and antique shops and yet one day they just suddenly seemed too much and a bit creepy – I halved them but then it was still too many and the rest just had to go – I kept one and one only . The same with the rugs – enought to use and enjoy and none tucked away in a linen cupboard ” just in case “. I really dont want anything “just in case “. I’m very happy with “just enough” for today . I dont have anything in storage under beds and I have lots of space in all my cupboards – a lovely feeling and according to Feng Shui principles leaves you open to new experiences and possibilities in your life . If every cupboard is crammed full of stuff there is” no room” for anything else. I actually still have one collection – West German Pottery vases – they will probably go one day but at the moment they all sitting happily above a kitchen cupboard and I enjoy their colours and shapes . My own experience tells me we are all capable of change and sometimes in unexpected ways! Hi Judith – was it you the other day who said about Feng Shui and not having anything blocking the doorways, accessways? If so that was a bit of an eye opener for me as stuff that I am sending to goodwill or to pass on, often sit in supermarket bags at my front door, and they don’t always leave immediately, I sometimes decide to wait until the bag is full. And really I’m blocking the process. I don’t know much about Feng Shui but am curious, but until recently it would have been a joke to try and implement in our house. Have you studied it or had someone in to Feng Shui your home or an early stage dabbler? Hi Moni ! Definitely a dabbler – I guess some of the things I have read make good common sense and are appealing . I bought myself a lovely little book two Christmas’s ago called “The Ultimate Guide to clearing your Clutter ” by Mary Lambert and it helped me work through room by room and she talks about Feng Shui principles in a very gentle way – nothing dogmatic . Somewhere in that book she mentions that piles of unsorted clutter are “stagnant pools of negative energy ” and that just resonated with me when I read it – and made me laugh because it sounds so awful! Even my husband agreed we didnt want any of those – but we actually found quite a few ! She also talks about creating a nice energy in a space – not just simply clearing the clutter. Could you find another place for the bags while they are waiting to go to the Thrift Shop ? I put mine in the boot and I find it easier to off load a smalller quantity rather than stagger in with lots of bags (after all this time you’d think i would have nothing left to declutter but trust me there is always more ! )Hope this helps! Hi Judith – “stagnant pools of negative energy” – I love it! Yes I am going to put them in the boot of the car from now on. I swear clutter breeds during the night. I’ll have thought I have de-cluttered an area, but a month or so later I will notice that its looking a bit feral again. My guess is that as I’m decluttering other areas, I’m finding stuff that’s not in its proper cupboard or space and it gets returned. And also each session on an area, the items that were borderline for being kept, just don’t make the cut the next time. Hi Dizzy – I have bookmarked the Karen Kingston book – have heard so much about Don Aslett but the only book of his available on e-reader is his Cleaning Encyclopaedia, I will have to have a look in the library. Thanks. I have friends who have decided that they won’t declutter until they need to ie given our age, it would more likely to be shifting house, than death. I can’t imagine putting myself under that kind of pressure in 6 weeks or less. Of course it is up to them and a lot can get done in a short time, but I have been at this 10 months now and it would average out to several items a day, and there is still plenty more that needs to go, including several items of furniture that are now deemed surplus since we started this process. The next time I shift house, I want it to be 4-6 hours max and no stress. Ladies, talk me thru this. I know what I should do but there is a little voice in my head stopping me. I have this kitchen appliance and it is a heated buffet thing. Three removable teflon containers that each have a heater thingee and a dial each. Each has a glass lid. I bought it 5 years ago and it did get a lot of use the first year, as my husband and I were in full swing of taxi-ing kids to evening sports and extra curricular events. My crock pot and rice cooker never made it off the kitchen bench. And this buffet appliance had the veges in it. I basically ran the evening meal like a smorgasboard that winter. Since then it hasn’t been used. I KNOW I KNOW it should go, I wouldn’t bother with ebay as they only $49 in kmart, so it would be freecycle. But for some reason THIS is the item I am struggling to part with. I’m thinking because in general I describe myself as “cateringly challenged” that that was the only time in my history that I felt ‘on to it’ with family meals. So come on ladies, talk some sense into me! Psyche me up this! Please note: it should have read: psyche me up for this. Moni, why don’t you take the pressure off yourself and set a time limit. Say 3 months. If you haven’t used it by then, THEN it can go. Would that work? What I would probably do is leave it out on the kitchen bench and when it seriously started to annoy me (2-3 days I’m tipping!) I’d freecycle it. 🙂 It hasn’t been used in four years! Its so weird that I’m reluctant to part with this, I think in my mind there is still hope for me to turn into this person who can whip up a feast for a crowd, and really all the appliances in the world isn’t going to make that happen is it! I am sure you are holding on because the item was so useful to you when it was needed. I can find it hard at times to declutter things that have served me well. But ultimately if it isn’t being used then it is probably best to pass it on. But like my post says if you aren’t ready to make that decision yet then don’t. Just keep working on the things you are happy to part with. But one thing to always be aware of is to be very mindful before buying items like this. It is s shame that you only got one seasons use out of it. I often think such and such and item would be useful but I let those toughs cool before making a well considered decision about buying it. Usually I come to the conclusion that I can manage without it. I thought for a long while that I would like a panini press but decided I didn’t really need it or at least I didn’t need it enough to warrant buying one new. I eventually picked one up secondhand and if I find I don’t use it much I can send it back to the thrift store where I got it. It has been used over and over again so far so it will stay for now. Hi Colleen – 🙂 What it came down to was that I felt I needed to make a decision, and I either had to come up with some good reasons to keep it, or good reason to let it go, dilly-dallying in limbo isn’t my style, especially something that wasn’t expensive, and really ticked all the boxes for my usual criteria for it to be jettisoned from the house. What I love about this forum is that we are opened up to all sorts of other ideas and perspectives. Someone on here (sorry can’t remember who) said that if a kitchen appliance doesn’t have more than one use (aside from the obvious like kettle and toaster) it doesn’t justify its existance. It is definately my policy now. My youngest was after me to buy a waffle maker and she was going thru a waffle stage, but I decided to just buy the frozen ones from the supermarket to see how long this stage lasted. Total: 3 weeks = 3 boxes of waffles versus an appliance that would now be sitting unused. Smart move with the waffle iron. I have had similar experiences myself at time. Putting off purchases is a great way to decide whether you really will use them or not. Chances are if you can out off the purchase you never “needed” it in the first place. However years ago I bought a crepe pan and it is useless for anything else. There have been time where it has sat idle but eventually it gets dragged out again and more recently on quite a regular basis. It will definitely stay for now. It was funny you mention crepes, because recently I thought about getting one (a friend had one but she shifted away) and then I discovered them at the bakery of my local supermarket. Have decided to make do with those for now but I do miss a good crepe cook up! crepes can be made n a regular (non-stick preferably as you do them only with a wipe of butter) pan just fine. Just make the batter go up the rim of the pan a little bit when swirling the batter in the pan to cover the bottom. Thus you get a good grip on the crepe to turn it around. I hope that explanation makes sense … But really: no extra equipment (or batter mixes or anything) is needed for either pancakes or crepes, just a recipe, a pan, some butter and a spatula to turn them over. Sounds like you managed a particular phase of your life extremely well, despite being “cateringly challenged ” ! (I think I am “cateringly challenged too!) Maybe you feel a little sad to let go of something that represents that part of your life that was managed so well and you want to get it back again . As Colleen says – take the pressure off yourself and leave it for awhile- if there is that much emotion attached to it then perhaps you need time to sort through your emotions which is totally reasonable ! Just a thought to help the process – maybe you will never need to be that organised food wise again – so it really has served its purpose – but it wasn’t the item – it was clever you and how you used it and you will probably be clever in different ways now! I agree with colleen and Judith. if you cant part with it. leave it and focus on something else. who knows, maybe, in 3 month time, you find a neighbour that needs something like it… keep it in the back of your head. every once in a while an item declutters itself, just because you are aware of your possessions. and you find the fate of the item before you actually identified the item as clutter. those moments are priceless. literally. Hi Judith – I think you are right, it represented a time when I felt I was in the driving seat of the kitchen. I have also concluded that it was a different phase of our life ie the eldest had just turned 13, now he drives his own car and doesn’t expect us to hold a plate for him if he has plans elsewhere. The girls mostly have evening dance classes and don’t feel up to a heavy meal when they get home, so eat a big lunch, a mini meal when they get home from school and something light after they get home with dancing. When they all leave home, which the eldest could be any time from here on, our feeding dynamics will change again (I swear that when they have all left home hubby and I will live in Subway and Turkish Iskendah for the first six months) – and so this buffet heater thingee served a purpose that we no longer need. I like Loretta’s idea of leaving it on the work bench where it is in the way. That would drive me nuts and I would have no problem getting rid of it. But we are all different and that may not be the solution for you. The big thing is that you KNOW that you need to let go of it but you are just hanging on for some reason. Would taking a picture of it and journaling about it and it’s use during that hectic year help? Hi Deb J – 🙂 no I’m not that attached to it that I need a photo. If I put it on the bench, my hubby will throw it out the window. I think that answers it doesn’t it? if you can’t part with it because it made you feel like a good cook, maybe just find some easy recipes that your family likes, that make you feel accomplished all again, that work without this device. good advice, Ideealistin, I call couscous my “emergency meal”… while the hot water sits and soaks, I am cutting all my left over veggies, fry them shortly in the pan, and mix all of it together with whatever spices I feel like. delicious meal in 10 minutes. Hi Idealistan – yes it represents an era of our life, and it was a happy era, I have this memory of hubby and son getting home from a basketball game and saying “smells good, yum, we’re hungry thanks” and me feeling quite pleased that we’d done all this ideal stuff supporting the kids interests and a hearty meal ready at the drop of the hat. My hubby says the reality is that from about halfway thru the season, him and my son would come home grumpy with each other tired and over hungry, he was wondering why we even bothered and ‘not casserole and cooked too long vegetables again, wish wifey would just let us get a burger on the 30 min trip home so maybe we wouldn’t feel so grumpy.’ – oh the truth comes out now! I do have a list of meals I can accomplish, but I’m not good at planning them, or remembering to actually defrost the meat in advance, or even remembering to start cooking! I have this ongoing problem though, that every single meal – there is always ONE of the FIVE of us who actively dislikes that particular meal. 4 out of 5 like it: sounds good to me (as long as it is not always the same person who doesn’t like the food). Too much pressure to make everyone happy every day imho. And there sure must be some crowd pleasers even for your family that you can throw in from time to time 😉 If I remember correctly it was if you don’t like it, don’t eat it at our house and none of us starved. Sometimes it was even a good way to dispose of some leftovers. Hi Ideealistin – 🙂 3 of us don’t eat fish & 1 of those isn’t keen on beef either. Hubby doesn’t like pasta. One daughter doesn’t like the taste of milk and most diary products. One doesn’t like stirfries, one doesn’t like mexican, two don’t like roast beef, one doesn’t like corned silverside, one doesn’t like mushrooms, one doesn’t anything pig, one doesn’t eat lamb since helping with bottle fed lambs. Oh and two of us won’t eat anything with a bone like a drumstick or chop. Yeah fussy. So someone is always either unhappy with the evening meal or is making something alternative. Everyone likes american hotdogs, as long as they get to assemble their own. 🙂 Pity they don’t feature on the healthy food pyramid! Hi Dizzy – can tell you understand the dancing class schedule! My daughter has told me that she prefers the Watties Steam Fresh bags – I don’t know if you have Watties in Oz but its now owned by Heinz so you might have something similar. It isn’t the cheapest way to do veges but the girls have their main meal after school (Viva La Crock Pot!) and they grab one of these 2-person portion bags, and they zap that in the microwave (if they can agree on the ingredient combination). Hubby prefers a salad. My son doesn’t care as long as there is food and lots of it. These buffet heater thingees are from K-Mart, which would be the same type as K-Mart as we have given we are both Down Under, so maybe have a looksee there. If you lived closer I’d be delighted (and relieved to give you mine) but Perth is just a bit tooo far. Family pretty good at pitching in with tidy up and prep. I have been down with the flu and was surprised my son knew how to cook the meal on Tuesday. Have been concerned lately that my attempts to teach him how to supply his own food over the years had fallen on deaf ears (turns out he has a better method: find a female he is related to and convince her to make him something – yeah I know, straight from the cave). But really it’s time to let it go. You put it in your trunk? Good. Now don’t you feel better already? Thought so. Next schedule a trip to the donation center & then breath a sigh of relief. Hi Jane – yes thru this process of talking it out with all you ladies I have concluded it is time and have learnt the emotional attachment I had to it turned out to be not quite the picture I recalled. See my comment to Idealastan above. 🙂 Nothing else that has been sitting idle for four years has been allowed to stay. Fab! I’m so proud of you!! Have been contacted by a lady on freecycle who wants to collect tomorrow – she sounds like me five years ago with kids and their afterschool activities – so once again it will serve its purpose. And that makes me happy. Hi Lena – have someone from freecycle picking it up tomorrow and she sounds like me five years ago, busy with kids and afterschool activities and so once again it will serve its purpose and that makes me happy. lol – this is hilarious. there is absolutely no clear solution to your problem. some say keep it, some say keep it for now, some say get it out, some say get rid of it. now please let us know what you are deciding on! Hi Lena – yes I have loved this. 🙂 This is what this blog is about, tapping into other ideas and perspectives, but especially from like minded people. As I have answered each person I have come to realisations and the decision is that it is going. Hubby doesn’t like it taking up room. Son remembers it as not being able to have a quick hamburger on the 30 min trip home from late basketball cause mum had food waiting. Older daughter remembers that the veges in it were always overcooked by time the last person ate. Younger daughter only remembers that the removable dishes had to be handwashed because they took up too much room in the dishwasher. OK. It appears I definately was the only person who had fond memories of it, and when I told hubby I was putting it on freecycle he was really happy and straight away suggested we get rid of the George Freeman grill too while we are at it. Here we go again! Hi Dizzy – yeah there’s something about beans that have been cooked for a couple of hours that just don’t appeal. Have a look for those Watties Steam Fresh bags, they’re in these little perforated bags that you chuck in the microwave for 3 mins (I think) and then tip onto the plate. They come in several combinations. Of course, its not economic to feed the whole family this way, but if someone is eating at a different time or if its only a couple of us, its a quick way to serve up veges, and yes they are crunchy! This has been so much fun ! Nothing like having family members smash your precious memories and give you their version of reality! Now that George Foreman grill – maybe just as well I never bought one – thought about it a lot though . Hi Judith – if I was going to do my time over with the George Foreman grill, I would buy the little one so it (a) wouldn’t take up so much space and (b) I could just chuck my food in there rather than having a dozen items in it. They are well made, and dishwasher friendly etc etc, but its much quicker to just chuck something in the pan. One of my friends has this theory – if there are heaps of them on Trademe (like eBay) down as ‘used once or twice’ its probably a good sign its not going to get used at your house. Good post Colleen. For me, decluttering slowly (after the initial first 2 years’ frenzy) means that I can thoughtfully dispose of items. For example our toaster died yesterday (only 5 yrs old, grrrr). My husband went and bought a new one and wanted to bin the old. I said I’d research where I could recycle it, so I found a scrap metal recycler locally and took it there today. If I’d had 50 things to get rid of at once I’d have been too overwhelmed to give this 1 item my full attention. Good on you Loretta. Having the time to do the right thing for the environment is a great thing. I think, at one point, I have to force myself to. (I managed getting rid of some last year, but some is still stuck and taking up space… ) One thing at a time, right? excellent post colleen. I really like this method for exactly those reasons. I can wait until I am emotionally ok to let go. I have a couple of items that I brought back from travels. and because those holidays in central america were the most fantastic adventure I ever had in my life, I cant give away the hammock I brought home. Its big (not soooo big, but it clearly requires its space) and I havent used it since I got home, because it was too small for the hooks I had in my room a couple of years ago. (and the process of putting a hole into the wall to place another hook is faaaar too much work – god knows why). So now I live with this hammock. I love it, I love it because its my reminder to let go and not always be stressed out and have a glass of rum once in a while. I will keep it, until I am done with music, books, dvds, plastic containers, documents, folders, pens, cleaning utensils, spices, creams, boxes, clothes, shoes, etc… maybe when I am done decluttering those areas, I will be able to find a solution for the hammock. One day, I will be there. the other thing that is so perfect about this: it doesnt require time and space (ok, my departure point is getting a little full lately, but the next fleamarket is in a couple of weeks). I dont have to make a huge chaos and get overwhelmed with it. decluttering one item a day is so fitting into daily life, its easy to do and slowly you notice space all around you. and you notice money coming in. I made already 50 euros on CD’s that were only stored in my self to serve the purpose of a “impressive” collection. I am done with impressive. I dont need peoples admiration, but independence from stuff. I am admirable enough without my possessions. This is exactly the post I was looking for to get out of my de-cluttering plateau. Take a second pass, and I may discover something that I should let go THIS time around! At first I felt bad for revisiting items. After all, “touch it only once” is a good advice for getting things done. But today I can see it as untying a knot. I am getting there and if it is not as fast as I would like it to be or as it is for others, it is not my fault, it is my challenge. And I am glad that I have (seriously) taken up the challenge because even if it feels like babysteps looking back I’ve walked quite a mile so far which motivates me for everything that still lies ahead. Another thing that motivates me: Sometimes the things take care of themselves later. Only weeks ago, right after moving together, we could not make a descision on which basket for dirty clothes we were to keep. They both had their pros and cons and as the space was able to hold both (though I hated the look of two, too cluttered) … Then we got a new plumbing pipe under the sink and all of a sudden, the one basket that had it’s place there did not fit anymore. Descision done. Freecycled within a couple of days (actually hours after I finally put it out). Getting rid of one thing a day has made it much easier to make decisions about what to get rid of and what to pass by for now. You don’t have to decide about everything at one time. You can just get rid of the easier things and save the others for later. By the time you get around to them, you will have more experience about decluttering and make better decisions. My son gave us a George Foreman grill a few years ago. He took one to college for his apt (the smallest one) and loved it so thought we would, too. However, he bought us a larger one and it is so much trouble to take it off the shelf, out of the box and use it. We don’t have much counter space and it takes up a lot of what we do have. It is too big to leave out and is one of the old ones that must be washed by hand. If my son had not given it to us, it would be gone. We do not have an outdoor grill so I do like using it in the summer when it is hot to cook on the stove. The other – too big gift – was a salad spinner. I asked my sis for a small one for Christmas one year and she said if small is good, big is better. Again, sits in its box in the pantry and only gets used when company comes. This may make it out the door the next time I get a box together. I am the only one of two in our house that even eats salad greens. I just use a towel to dry my lettuce leaves. Hi Maggie – I have the large George Foreman grill too and wish I’d bought the small one in stead. My answer to people saying big is better is to reply that compact is cuter! I know where you are coming from Maggie, items are only as good as the ease of use or the space you have to use them in. I used to have one of those large salad spinners too but it was a pain to store and a pain to wash up. Then my husband stopped taking salad for lunch so I was glad to be rid of it. I did recently get a panini press from the thrift store which has come in quite useful in fact I think I will do French toast for breakfast this weekend with it. It does take up space in the pantry but I have so much space these days that doesn’t matter. One question ~ Why do you insist on keeping things in the original box? Surely that just adds to the difficulty to use them. I only have one item in a box and that is my crepe pan. I keep it in the box to protect its teflon coating which is crucial to its function. I keep these things in their boxes because that gives me a flat surface to put my crab pot on. The grill has a slanted top and the salad spinner has that spinning knob so the box makes it more efficient for storing other things on top. My pantry has my fridge in it, too (a long story) so the shelving is around one side and over the top of the fridge. With limited shelving, I make do. My dream kitchen will have the fridge out of the pantry and a door put back on it for use as a real pantry. Boy, could I clean up the kitchen with that. I’d love to put all my electric appliances and big pots in there. Our house is very old (80+ yrs) and we don’t have an electrical outlet on the other side of the kitchen so for now, I have to work with what I have. This is my husband’s childhood home and he is VERY resistant to change. Slow but sure, I am making changes.